In this work, a direct enantioselective HPLC monitoring system is developed. The system consists of an HPLC equipped with an immobilized cellulose-based chiral stationary phase Chiralpak IB, UV and a polarimetric detector in series. The developed system is used in the direct monitoring of the enantioselectivity of lipase-catalyzed enantioselective esterification of 2-phenoxy propionic acid of which the (R)-enantiomer is a precursor of the (R)-2-(p-hydroxyphenoxy)propionic acid known as an important intermediate in synthesizing aryloxyphenoxypropionic acid based agrochemicals. The versatility of the biocatalyzed reaction in chiral separation to access to both enantiomers of racemic 2-phenoxy propionic acid is demonstrated. 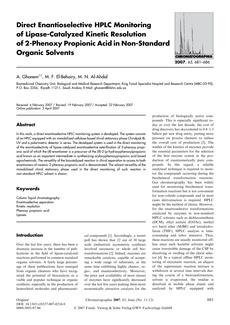 The solvent versatility of the immobilized chiral stationary phase used in the direct monitoring of such reaction in non-standard HPLC solvent is shown.